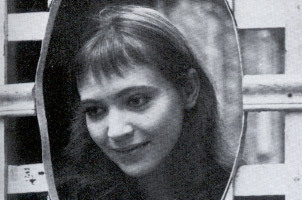 Godard at his most off-the-cuff takes a Serie Noire thriller and spins a fast and loose tale that continues his love affairs with Hollywood and with actress Anna Karina. Karina at her most naive is taken up by two self-conscious toughs (The little suburban cousins of Belmondo in A Bout de Souffle, is how Godard described them), and they try to learn English, do extravagant mimes of the death of Billy the Kid, execute some neat dance steps, run around the Louvre at high speed, and rob Karina's aunt with disastrous consequences. One of Godard's most open and enjoyable films. - Chris Petit, Tine Out Film Guide. Bande a part illuminates with even greater clarity than before that no man's land between reality and fantasy which Godard has made peculiarly his own. Arthur, Franz and Odile inhabit a strange, moonstruck landscape in which everything belongs but nothing quite seems to fit. They plan a robbery which will end in violence, yet spend their time practising dance routines in cafes, beating records for touring the Louvre, or racing their car in aimless circles; their world is the familiar grey of a Parisian suburb, yet tigers roar farouchely just around the corner, and the house they plan to rob rises like a ghostly palace from a misty river. Throughout, though, the fleeting moments when the elusive crystallisation of fact and fantasy takes place are unerringly pinned down: when Odile suddenly realises that she comes from the same race as the people sitting round her in the Metro; when Franz sees Arthur beating Odile up and begins to understand what it is all about; when a dead woman huddled in a cupboard makes a game not a game; or when all three are concentrating on their dance, and Godard's voice breaks in to try to describe what each of them feels. In a sense, the whole film is a metaphor illustrating this glancing collision, when fantasy and reality merge but one may still remain unsure which is which. Soon after the film opens, for instance Arthur writhes on the road in a hilarious parody of a Hollywood killing, and at the end he dies in a cruel parody of his own parody. One may laugh, indeed one is invited to laugh, but here distinctions between comedy and tragedy have been smoothed away, and even before the final shot of Arthur lying dead under the trees, the sequence is pervaded by a profound sense of sadness: Arthur has made a mockery of himself, without ever realising what he is, what death is, or what his actions mean. For although Godard is a moralist in the sense that his bad characters always end badly, he never judges their motives: instead he considers their actions. Essentially, therefore, he is an artist of the moment, seizing an intangible instant out of the air to try to set it down for contemplation. Bande a part is made up of such moments - when Arthur, Franz and Odile catch an obscure glimpse of meaning - set in a wider canvas of marvellous set-pieces such as Odile's joyous race from the house to the river, the dance in the cafe, the minute's silence, and the seduction in the language school. To talk of performances in such a film is pointless, but Brasseur, Karina and Frey are an integral part of its texture; and Coutard's camerawork is faultlessly brilliant. - Tom Milne, Monthly Film Bulletin, December 1964.